European smart-home dealers get their first RadioRA products -- RA2 Select -- some 20 years after Lutron launched the iconic wireless lighting-control brand in the U.S.
Rah Rah RA! 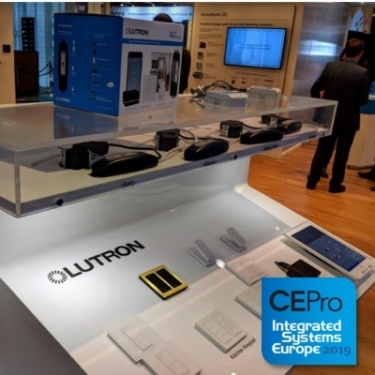 European smart-home dealers get their Lutron Radio RA2 Select at ISE 2019. Home-technology integrators in Europe rejoiced last week when Lutron introduced the RadioRA brand of wireless lighting controls to the region for the very first time. At ISE 2019, the smart-home giant showcased the EMEA version of Radio RA2 Select, a kinder, gentler version of Lutron’s flagship Radio RA2 model. Lutron pioneered wireless lighting control in 1997 when it introduced RadioRA, which would become a wildly successful smart-lighting brand for the mainstream residential market … in North America. Alas, the Europeans would have to wait. Even while thriving on Lutron’s most advanced line, HomeWorks, they salivated over the prospects of the more accessible RadioRA family. Now they have it. Lutron chose to launch the “Select” version of Radio RA2 rather than the original, fuller-featured version, in order to reach a broader audience of low-voltage integrators and electrical contractors, a Lutron rep said at ISE. Launched in the U.S. at CEDIA Expo 2017, RA2 Select is simpler to install than the original RA2, with an app-based tool for enrolling and configuring Lutron’s own smart lights and shades. The system revolves around a small hub, the RA2 Select Main Repeater, which communicates locally with Lutron switches, dimmers, shades, sensors and Pico keypads via the company’s proprietary 868-MHz ClearConnect RF technology. Up to four Lutron wireless repeaters can be added to the ecosystem to extend the RF reach. In all, one system can support up to 100 of these ClearConnect devices, including repeaters (vs. 50 for Lutron Caseta and 200 for RadioRA 2). RA2 Select also integrates cloud-to-cloud with a few popular smart-home devices from third-party providers including Nest and Sonos. The system can be controlled by voice through Amazon Alexa, Apple HomeKit (Siri) and Google Assistant. In addition, RA2 Select integrates with several of the most popular home-control systems in the custom installation channel, including Control4, Crestron, Elan, RTI, ProControl, Savant and URC. The programming and performance of RA2 Select is similar for both the U.S. and European models. The difference is in the physical installation. The U.S. system uses all-in-one RF-controllable wallbox dimmers and switches that replace existing (dumb) dimmers/switches. In the European version, the RF-controllable dimming and switching modules are moved out of the wallbox and into the ceiling (probably), in line with the lighting loads. They are controlled with separate RF Pico remotes/keypads. RA2 dimmers/switches require a neutral wire – commonly run to switch locations in U.S. homes, but not necessarily in other parts of the world. The industrial design of the European faceplates differ from U.S. models as well. RA2 Select main repeater allows for setup, control, and monitoring of select lighting devices and Lutron wireless shades from a smartphone or tablet using the Lutron App. Supports up to 100 wireless devices (including dimmers, switches, Pico wireless controls, and wireless shades). The main repeater and additional wireless repeaters each count as one device. Programmed via the Lutron App (available for iOS and Android). Scene control via the Lutron App and Pico scene keypads. Timeclock scheduling of daily events via the Lutron App. Connects to the Wi-Fi router via an Ethernet connection. Local device operation will continue to function if internet connection is lost or if the main repeater is powered down or not communicating. System access from anywhere in the world using the Lutron App. Control outside the app via widgets (iOS and Android). Supports Geofencing from the Lutron App. Supports integration with other smart home brands including Amazon Alexa, Google Assistant, Nest, Sonos, and more. Up to 4 wireless repeaters (LK-REPPRO-BL) can be added to extend the range for larger systems. Automatically programs Pico wireless controls for typical applications and activities or program additional custom scenes using the Lutron App. Integration with select professional A / V and security systems. Sivoia QS Triathalon and Sivoia QS Wireless roller shades, drapery track, Kirbé, and Roman shade systems.